“We reaffirm the importance of the EU relations with Turkey and reiterate our commitment to maintaining an open dialogue, to addressing common challenges and to cooperating in essential areas of joint interest such as migration, counter terrorism, transport, economy and trade,” the leaders said in the joint declaration came after the summit. The summit, demanding Turkey to normalize its relations with its EU neighbors, reiterated its call on the candidate country to fulfil its pending obligations under the Negotiating Framework. Speaking to the reporters following the summit, Greek Prime Minister Alexis Tsipras said he will meet with Turkish President Recep Tayyip Erdoğan next week in Istanbul and inform him about the summit declaration. He also emphasized that international law and mutual respect is the hinge of Turkey-EU relations, as in relations of all EU member states. On the irregular migrants crisis, Tsipras said the EU needs new asylum system based on solidarity and fair share of responsibility. However, the declaration called for reforms in the current Common European Asylum System. The Turkish Foreign Ministry has slammed a joint declaration adopted at the Fifth Summit of the Southern European Union Countries (Med7) held in Greek Cyprus on January 29 with the participation of France, Italy, Spain, Malta, Portugal, Greece and the Greek Cypriot administration. The move “provide yet another example of the unfair and unconstructive attitude maintained by certain EU members, in the name of the so-called ‘Union solidarity’,” said a Foreign Ministry statement on January 31. 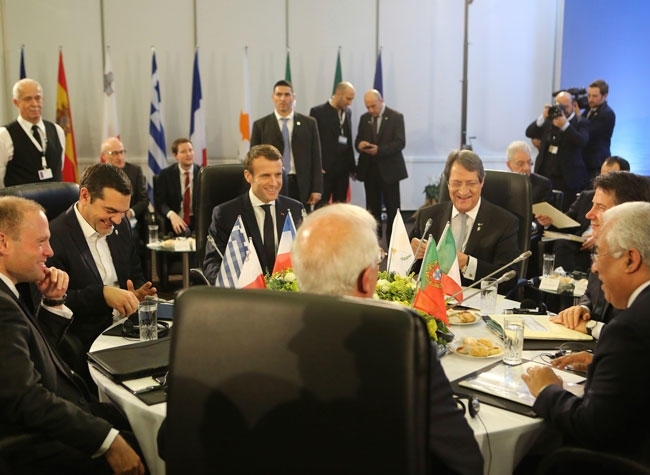 “The commendation in the declaration of the so-called efforts by the Greek Cypriots regarding the settlement process in Cyprus and the expression of support for their unilateral hydrocarbon activities in the Eastern Mediterranean clearly display the continuation of the Greek Cypriot administration’s abuse of its EU membership,” it added. Turkey remains committed to taking the necessary steps to protect the legitimate rights and interests of the Turkish Cypriots, said the statement. Turkey-European Union cooperation is significant in defiance of common challenges, leaders of a group of members agreed on January 29. “We stand firmly by the Withdrawal Agreement and we intend to proceed with its ratification,” the declaration said. The EU leaders also underlined that they attach particular importance to the strengthening of relations. Another summit of the bloc, EU-League of Arab States Summit will take place in February 2019. U.S. President Donald Trump’s decision to withdraw U.S. troops from Syria was a big shock to not only the American public, but also the rest of the world. There is still uncertainty on U.S. foreign policy on Syria, but it seems like Trump is determined to keep his commitment. The recent ISIL attack in Manbij put increased pressure on Trump to reconsider his withdrawal decision in Syria. ISIL has continually demonstrated a desire to draw the U.S into Syria. It began by killing Western citizens and accelerated bombings in Europe to increase the likelihood of Western intervention. In spite of all this, Turkey doesn’t think that Trump will back down from his withdrawal decision after this attack in Manbij. The U.S. understands Turkey’s security concerns in northeast Syria but stresses the importance of not mistreating the YPG. The efforts of Turkey in its struggle against the PKK, a wing of the YPG, have taken 40,000 lives. Furthermore, U.S. officials have previously acknowledged on the record that the YPG and PKK are the same organization. It must be remembered that 300,000 Syrian Kurds have escaped the horrors of both the YPG and Daesh – the Arabic acronym for ISIL – and sought refuge in Turkey. Over 15 million of Turkey’s 80 million citizens are of Kurdish ethnicity. Turks of Kurdish ethnicity are tightly integrated into Turkey’s government, business, and various other industries and have attained the highest positions in each of these fields with significant contributions. According to the Syrian Kurdish National Council (ENKS), which consists of more than 10 Kurdish political parties, the YPG regularly commits human rights violations and discrimination against Kurds and Arabs that do not share their ideology. Turkey has had 14 major ISIL attacks and lost over 300 citizens/security personnel over the past three years. Turkey has no doubt suffered at the hands of Daesh/ISIL in the region. Both Turkey and the U.S. are looking to finalize the agreement of what we can expect next for the Manbij road map as well as finding a solution for the YPG which links to the PKK – a clearly labeled terror organization. Turkey is very confident in accepting the idea of safe zones in northeast Syria. Even safe zones can be protected by select NATO Allies as long as Turkey’s security is safeguarded against groups like the YPG, PKK, and Daesh. A solution in Syria without Turkey is impossible. Apart from its work combatting terrorism, Turkey’s contribution to post-war infrastructure and projects concerning refugees and Syria, in general, are of immense importance. It is safe to conclude that Turkey has a significant and valuable responsibility in Syria. The United States and Turkey must find ways to support and defend each other’s national security concerns to uphold the principles that both countries share. Turkey has consistently advocated for a resolution led by international initiatives and states with the aim of respecting the territorial integrity of the countries in conflict, meeting democratic demands of the people of the region and restoring public order. Turkey is a country that has always fought for world peace shoulder to shoulder with the U.S. since the Korean War. It is crucial for diplomatic channels to remain open. The good news is that both U.S. and Turkish officials are continuing to have meetings this month. President Recep Tayyip Erdoğan and Trump have spoken three times since last month. An American delegation was in Ankara last week. Joint Chiefs of Staff Chairman Joseph Dunford and his Turkish counterpart Yasar Guler met in Brussels, and Senator Lindsey Graham met Erdoğan in Ankara. The fact is, an unstable Turkey does not benefit the strategic interests of the U.S. and Turkey, nor does it serve peace and stability in a region already devastated by volatility. Understanding Turkey’s security concern and securing her border would make the West safer.